About a month or so ago, I picked up this fun distressed knit (it looks like a sweatshirt, but really is more of a thick knit) – it was too fun to pass up, but I had no idea what to do with it…. until I was in a store and saw a cool sweatshirt made from a similar fabric. 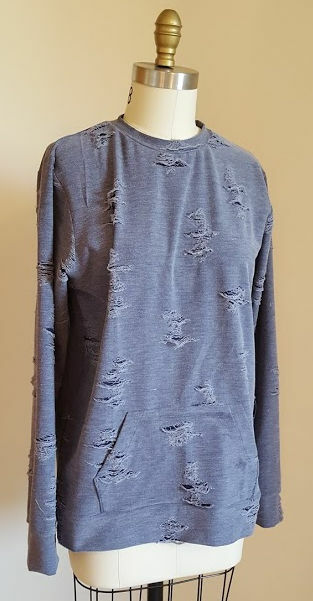 The distressed look is apparently a “thing” because even Bloomingdale’s has something similar (but with a hefty price tag) so I decided to create my own. Once again I whipped out Jalie 3355, using the basic sweatshirt pattern with a kangaroo pocket. I used the same material for the neckline and sleeve\hem bands, but quickly discovered that the fabric didn’t really have great stretch for these areas. I really wanted to avoid an overstretched\too gathered look and definitely didn’t want to fight with the fabric inserting the bands, so I wound up re-cutting these areas to add some length (basically making them close to the same measurement as the sleeve\waist). And I LOVE the end result! It’s comfortable to wear and I love it so much more than the Bloomingdale’s version. Plus my version cost $18! This entry was posted in Uncategorized on December 8, 2017 by stacy. You know what makes sewing around the holidays even better? Fun freebies! There are several independent pattern companies that are running 12 Days of Christmas promotions: Patterns For Pirates (emoji pillows, camera straps, and cut files for sizing tags and this great head warmer tutorial that transforms a headband into a hat!) and Winter Wear Designs (get a free Cross Hem Tee when you enter code 12DAYSDAY2 at checkout, plus cute cut files to embellish tees and more). Plus don’t forget Ornament Week at Flamingo Toes. Win a bundle of Cotton & Steel fabric! Stay warm and look fashionable with this faux fur collar wrap. Before you leave the site be sure to enter to win a huge Sulky Thread and Stablizer giveaway. Packing for the holidays? Whip up one of these fun duffel bags. Gifting pajamas this Christmas. Keep it cozier by making a new robe, too. Want to make the package even more special? Make matching pillowcases too (make it two different ways). Keep the kitchen festive with these Merry & Bright towels. 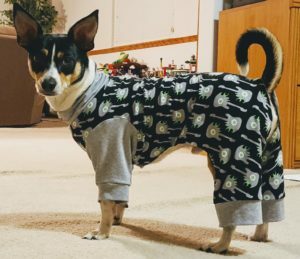 If my post the other day about Jimmy’s Jammies got you in the mood to make dog clothes, then you won’t want to miss this tutorial for an Upcycled Dog Sweater (XS-S sizes only). This entry was posted in Uncategorized on December 7, 2017 by stacy. 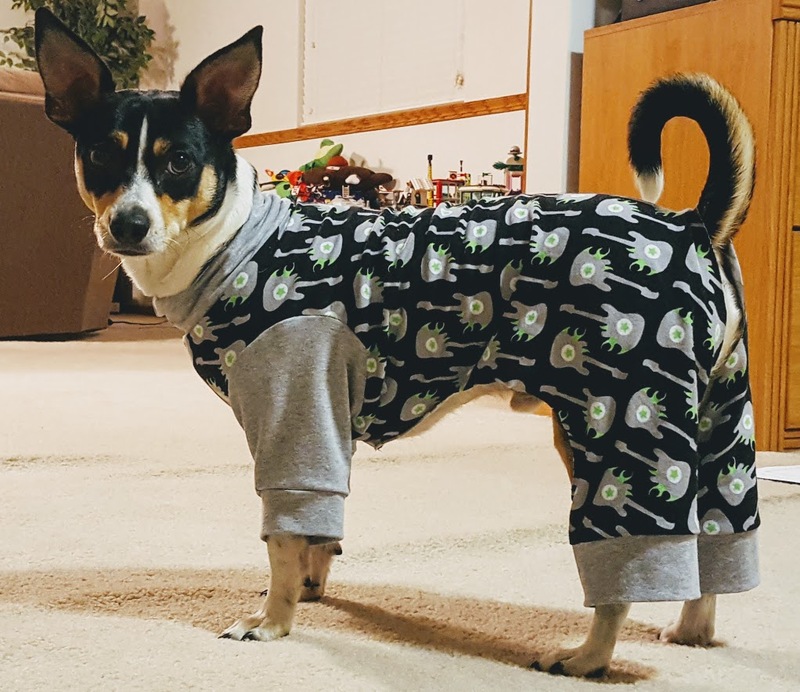 Last week I had blogged about making a pair of Christmas pajamas for our dog, Jimmy. Just in case you missed the post, I should probably let you know that I don’t normally dress up our dog, but it’s a tradition to give pajamas on Christmas Eve and everyone wanted him to get in on the fun since this is his first Christmas with us. What you are looking at, is Version 2: a slightly shortened neck band and the body lengthened about 1″. This fit is much better this time around and he’s no longer stepping out of the back legs. He doesn’t seem to mind wearing this one around so we’ll see how Christmas morning goes with this on! This entry was posted in Uncategorized on December 5, 2017 by stacy. Easton’s classroom adopted a child from the Angel Tree this year. Unfortunately, funds came in a little short, so I decided to donate an item that was on her wishlist: A purse. Since this was a very last minute sew, I didn’t have a change to sew up something too complex – so I winged it. I wound up making an 11 x 13 crossbody (the strap is adjustable so it can also be worn on the shoulder, too) with a zippered closure, and a fun emoji print. Overall it’s pretty basic, but I think it will work. I also found a pretty pouch at the Target dollar spot and embellished it with her name (using vinyl and my Cricut) and added a few bath bombs inside. Unfortunately, I didn’t snap a photo of that one, but you get the idea! 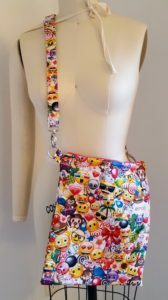 Now it’s back to the sewing room – I have so many plans and not enough time! This entry was posted in Uncategorized on December 4, 2017 by stacy. One of the fun things that I got to work on last week was the latest release from George & Ginger, The Posh Top. 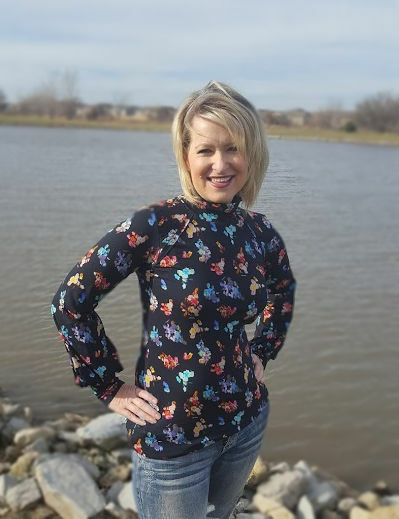 This is a fun little style that features a high(er) neckline, color blocked trim along the collarbone (in hindsight I should have tried for bolder color to make it stand out), and fabulous gathered sleeves… it’s a great looks for the holidays! Plus for today only (Friday, December 1), you can get 25% off your total purchase by using code YEARTWO at checkout. As for fabrics, I made this version in a Nicole Miller print that I snagged from Joann’s last summer (it had an Asian sort of feel to it which is perfect for the cheongsam type design that this top has) – it is a heavier weight rayon-poly type blend that is perfect for this top (firmer stretch fabrics will give the gathering on the sleeve a lot more structure and won’t make it flop over). This entry was posted in Uncategorized on December 1, 2017 by stacy.